Best known AS the Bass Player with Irish Rock Band U2 Adam Clayton was Born this day 13th March in 1960. Clayton has resided in County Dublin since the time his family moved to Malahide when he was five years old in 1965. Clayton is well known for his bass playing on songs such as “New Year’s Day”, “Bullet the Blue Sky”, “With or Without You“, “Mysterious Ways“, “Get on Your Boots“, and “Magnificent“. His work on No Line on the Horizon has been cited as his best bass playing. He has worked on several solo projects throughout his career, such as his work with fellow band member Larry Mullen Jr. on the theme of 1996′s Mission: Impossible. Clayton, as a part of U2, has also won 22 Grammy awards. Born in Chinnor, Oxfordshire, England, his family moved from Oxfordshire to Malahide, County Dublin When Clayton was five years old, where Clayton attended boarding school first at Castle Park School in Dalkey, then at St. Columba’s in Rathfarnham. He later changed school to Mount Temple Comprehensive School in Dublin, where he met fellow bandmates Paul “Bono” Hewson and Larry Mullen Jr., and was reunited with his boyhood friend Dave “The Edge” Evans. Mullen had posted an advertisement on the school bulletin board for musicians to form a band with him; Clayton showed up at the first practice, which also included Dik Evans, Dave Evans’s older brother, Ivan McCormick, and Peter Martin, who were two of Mullen’s friends. McCormick and Martin left the band soon after its conception. While the band was a five-piece (consisting of Bono, The Edge, Mullen, Evans, and Clayton), it was known as Feedback. The name was subsequently changed to The Hype, but changed to “U2″ soon after Dik Evans left the band. As a bass player, Adam Clayton’s most recognizable basslines include “New Year’s Day”, which evolved out of an attempt to play Visage’s song “Fade to Grey”, and “With or Without You”. His style includes Motown and reggae influences, and cites artists such as Paul Simonon of The Clash as influences on his musical style. When Clayton first joined the fledgling U2, he did not have formal training in the bass. In the band’s early years, he generally played simple parts in 4/4 time. He has also sung on several occasion, including on the song “Endless Deep”, the B-side to the single “Two Hearts Beat As One” from 1983. Clayton also sung backup vocals on “I Will Follow” during live performances in 1983 and 1984. He also spoke the last verse of “Your Blue Room”. Clayton can be heard speaking on “Tomorrow (’96 Version)” (a rerecording of “Tomorrow” that he arranged) a song from U2′s 1981 album October. He plays the guitar on a few occasions, most notably the song “40″, where he and guitarist The Edge switch instruments. He also plays the keyboard introduction to “City of Blinding Lights”. Clayton and U2 have also won numerous awards in their career, including 22 Grammy awards, including those for Best Rock Duo or Group seven times, Album of the Year twice, Record of the Year twice, Song of the Year twice, and Best Rock Album twice. I would also like to watch the Oscar Winning dramatic thriller Argo on DVD. 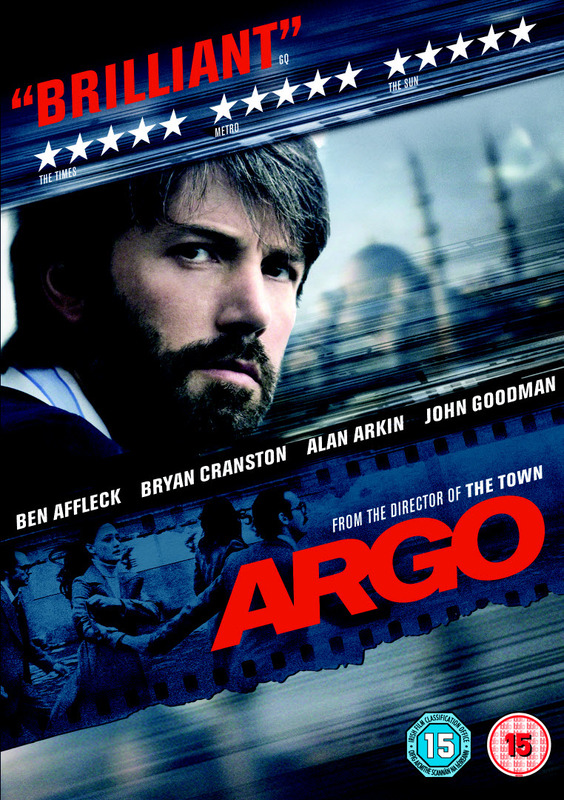 Starring Ben Affleck, The film is based on real events and chronicles the 1980 covert operation by joint CIA and Canadian forces to extract six fugitive American diplomatic personnel out of revolutionary Iran, after the the American embassy in Tehran was invaded by Militant Iranian revolutionaries and fifty two Americans were taken hostage. However, six six Americans manage to slip away and find refuge in the Official Residence of Canadian Ambassador Ken Taylor. Knowing it is only a matter of time before they are found out and likely killed, the Canadian and American governments ask the CIA to intervene. So The CIA turns to their top “exfiltration” specialist, Tony Mendez, to come up with a daring plan to get the six Americans safely out of the country. So he creates a phony Canadian film project called “Argo” which is looking to shoot in Iran and tries to smuggle the Americans out as its production crew. With the help of some trusted Hollywood contacts, So Mendez created the ruse and proceed to Iran as its associate producer.